Follow-Up: What's Being Seen In Loveland? 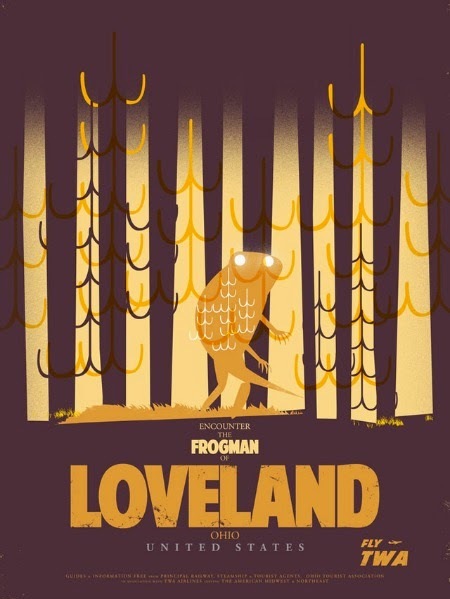 On Saturday, I posted an article that described a supposed recent sighting of the Loveland Frogman. Micah Hanks posted a follow-up to this account on Mysterious Universe. Over the years, I have received several eyewitness statements in reference to a frog-like humanoid seen on the Little Miami River in Loveland, Ohio. Many people have referred to this reports as hoaxes or simply false sightings of large bullfrogs. Again, I am offering some of the accounts I have received for your perusal. Finally, and I do mean finally, I have a chance to share my story. I have witnesses that can account to my stark fear the night it happened. Unfortunately they still laugh at me about my claims till this day. I used to live on Davis Rd. in Loveland, Ohio. I lived in an old cabin with a friend. I cannot remember the exact date for the life of me. But I do remember it being in December of 2013. It was approximately 10pm at night and it was one of the first snows on a fairly cold almost freezing night. When I first moved in with my friend I no idea about Frogman or Mothman and Popelick Monsters. Sometimes when I was exploring the creek next to the cabin that led to a stones throw distance to the Little Miami River, I found carefully stacked towers of stones in the creek. I felt it was very strange and had a leery feeling about them. It seemed like something a witch was doing for ceremonial purposes. Although I wasn't exactly 100% sure I usually slept it off as something the neighbor kids were doing. But what was even odder and scarier is the very next day I noticed the stacks of rocks would change and move to different spots. Sometimes there were more of them in certain areas. A part of my mind passed that notion off as seismic actions in the ground and flow of water in the creek. Very peculiar, yet feeling like I was always being watched. I felt special, and afraid at the same time. It was one of those things I always hastened to mention until now. And till this day can show someone where it is. I moved in late Summer and nights came with the sound of screeching, hissing and growling animals way in the distance at first. Here's where it starts to get scary. It seriously felt like whatever animal that was fighting or in pain was knowing I heard it from a vast distance. I would purposely summon the anguished screeches sometimes. And as the Summer turned to Fall the screeching came closer and closer. Huffs, hisses and seemed to puff air and growled. Thus phenomena was so similar to a raccoon in a fight that it was very easy for me to pass it off as just that, a fighting raccoon or a raccoon fighting with a cat. But again something was different and that feeling of empowerment came with it. It got to a point I felt like I had the power to sort of "call it out". As Fall approached Winter the crying raccoon, or almost like a deer warning call came, and seemed to meander around the forest that surrounded the cabin we lived at. I never really believed in ghost and ghouls so I'd pass it off as my mind playing tricks on me with the sound of the waves in the current of the Little Miami River. Then as the leaves were almost all gone there was the first snow fall that year. I was on the back patio of the cabin when the screeching animal sound was at the hillside directly behind our cabin in the backyard. At first I was excited, finally I could confirm the two red glowing eyes were a creature hunting and attacking a raccoon. Then the eyes looked directly at me. I thought to myself "no way is it looking at me..." But it was. It was a black dark mass. I spoke in a whisper and "dared it to come at me.." I was completely taken back and petrified when out if nowhere one of the eyes lifted up really high and the other eye joined up to it. This black massive object or thing seemed to be very curious at me and started tracing the hillside headed towards my way. It started a vertical path about 300 yards away. I even remember saying "no way is it really coming my way". But I knew it was. It got louder...it was big and thumped in the rough and got quicker and quicker. I challenged whatever this creature was and stood my ground until it was literally only a few dozen yards trampling towards me. And when it thumped closer it got fast and seemed monstrous and huge. Yes I turned and ran in excited fear for my life. So much fear I jumped over my friend's motorcycle and ran into the house slamming the door behind me. I ran inside and bolted upstairs charging into my friend's room upstairs where they were all playing video games and acting like nothing was happening. My one friend Jim went to the window laughing at me and said yes, there seemed to be a gust of escaped steam in the cold of the Winter night shining against the bright of the back porch security light. My friends joke at me till this day. They say Frogman says 'Hi,' Said it was Froglady in love with me. I know what I saw. I am not crazy. I hate it that nobody else was with me. And I'll never summon that beast ever again. Jack T.